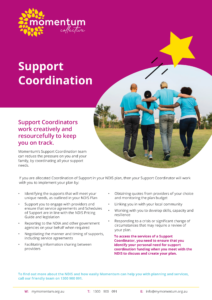 Support Coordinators work creatively and resourcefully to keep you on track to ensure you’re connected to the appropriate supports you need to achieve your goals. A Support Coordinator is independent to the service delivery team who provide your supports. To access the services of a Support Coordinator, you need to ensure that you identify your personal need for support coordination funding when you meet with the NDIS to discuss and create your plan.